"Sampath Speaking" - the thoughts of an Insurer from Thiruvallikkeni: digital banner at Coimbatore for Morgan Freeman ... tribute to Mandela !! 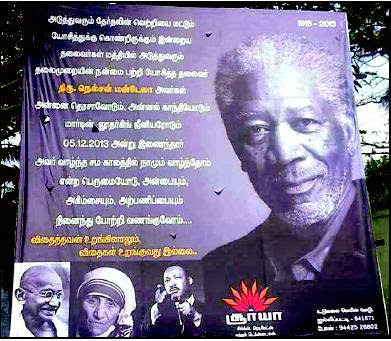 digital banner at Coimbatore for Morgan Freeman ... tribute to Mandela !! It was no ‘butterfly effect’ spoken in chaos theory ~ the sensitive dependency on initial conditions in which a small change at one place in a deterministic nonlinear system can result in large differences in a later state. ………….. the plot of the movie was the release of that political prisoner from Victor Verster Prison after having spent 27 years in jail. Four years later, he is elected the first black President ~ he could see tremendous ill-will between the groups ……….a game teaches him a good lesson….. a rugby match between Springboks, the country's rugby union team, and England, whence he sees that the blacks in the stadium are cheering for England, as the mostly-white Springboks represent prejudice and apartheid in their minds. As the Nation was set to host the 1995 Rugby World Cup in one year's time, he persuades a meeting of the newly black-dominated South African Sports Committee to support the Springboks. He then meets with the captain of the Springboks rugby team, François Pienaar (Matt Damon), and implies that a Springboks victory in the World Cup will unite and inspire the nation. He also shares with François a British poem, "Invictus", that had inspired him during his time in prison. No clues needed…….. the man is Nelson Mandela… ‘Invictus’ was the 2009 biographical sports drama film directed by Clint Eastwood; starring Morgan Freeman. The story is based on the John Carlin book Playing the Enemy: Nelson Mandela and the Game That Made a Nation about the events inSouth Africa before and during the 1995 Rugby World Cup. The title Invictus may be translated from the Latin as "undefeated" or "unconquered", and is the title of a poem by British poet William Ernest Henley (1849–1903). 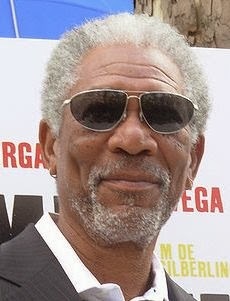 The hero - Morgan Freeman, is an American actor, film director, and narrator. Freeman has received Academy Award nominations for his performances in Street Smart, Driving Miss Daisy, The Shawshank Redemption and Invictus and won in 2005 for Million Dollar Baby. He is known for his distinctively smooth, deep voice. One doesn’t know how Morgan Freeman, the American actor, would take it. Would he see this as the ultimate tribute to his portrayal of Nelson Mandela in the landmark film, ‘Invictus’? Well, Mandela fans on twitter were outraged that a billboard raised in a village near Coimbatore as homage to Madiba carried the photograph of Freeman. Chandrasekaran, a 29-year-old textile shop owner in Jallipatti, a village about 45km away from Coimbatore city, had no inkling that his decision to pay homage to Madiba would end up as a fiasco. As soon as he heard about Mandela’s demise last Thursday, he placed an order with a Madurai-based designer for a billboard featuring Mandela alongside Mahatma Gandhi, Mother Teresa and Martin Luther King. The design was mailed to him and the next day the flex banner was printed and the billboard erected on Udumalai Main Road near Jallipatti. All was fine until one of his friends, Thangaraj, a college student, pointed out that the Mandela on the poster was not the South African legend but Hollywood actor Morgan Freeman who donned the role of Mandela in ‘Invictus’, a film on the truth of the new South Africa seen through the reconciliation of the South African rugby team, Springboks, once the symbol of white supremacy, with the democratic political order. “I had asked the designer to design the banner as quickly as possible and it seems he Googled for Mandela and got Freeman’s picture from one of the movies and used it. It was an honest mistake and I regret it. I have actually got the banner replaced with Mandela’s photograph,” said Chandrasekaran. Chandrasekaran is a small-time businessman who has studied up to Class 12. He said he was deeply influenced by the struggle and suffering of Mandela. The text in Tamil on the banner hails Mandela as a great political figure unlike the ones in India, whose ultimate motive is to win elections. “I dictated the words to be used in the poster but never realised that such a goof-up could happen. I also failed to notice it was not Mandela as I asked my people to get the banner ready and put it up at a good spot,” Chandrasekaran added. Ironically, Chandrasekaran has not been alone in confusing Freeman with Madiba. A large number of people had tweeted condolence messages with Freeman’s picture. But Chandrasekaran has not seen a single movie of Freeman but has promised to watch ‘Invictus’ as soon as possible. Incredible site you have here, so much cool data!.. Clipping Path Services It was a decent post surely. I altogether appreciated understanding it in my lunch time. Will without a doubt come and visit this blog all the more frequently. Much obliged for sharing.